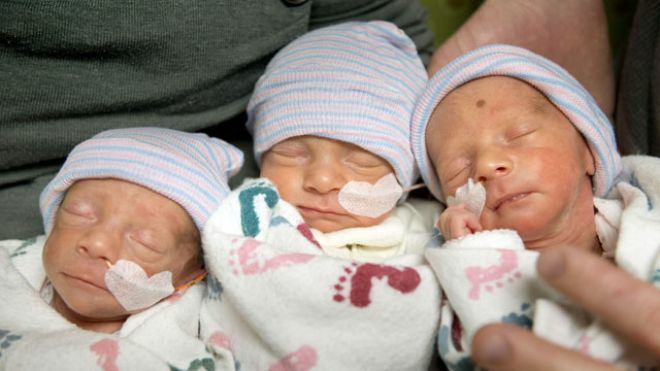 A Northern California hospital is home to a rare set of identical triplets, who were conceived without the help of fertility drugs. Abby, Brindabella (Brin, for short), and Laurel Hepner were born at Sutter Memorial Hospital in Sacramento to parents Hannah and Tom on November 22. The girls are all named after family members or special places in the lives of their parents. Brindabella is named after a mountain range in Australia located near where Tom Hepner grew up. “The end of the year is going to be big in our families I guess,” Tom told KTXL-TV. The Hepners live in Quincy, California, approximately 100 miles north of Sacramento. A month before the births, Hannah Hepner was airlifted to the hospital to begin receiving treatment from a team of specialists. Sutter offers a program for so-called “moms of mutiples” to help them through their pregnancy. The triplets were produced when a single, fertilized egg split into three. Dr. William Gilbert, director of Sutter Women’s Services, told the Sacramento Bee the odds of producing identical triplets without fertility drugs range from 1-in-1-million to 1-in-100-million, adding that the rarity makes it difficult to more accurately calculate the frequency of such births. Abby weighed 3 pounds, 2 ounces; Brin 3 pounds, 11 ounces; and Laurel 4 pounds. Gilbert told the Bee those were good weights for triplets and said the girls were doing well. The sisters are still in the hospital until they can maintain body temperature and eat properly. Brindabella – what a gorgeous name!